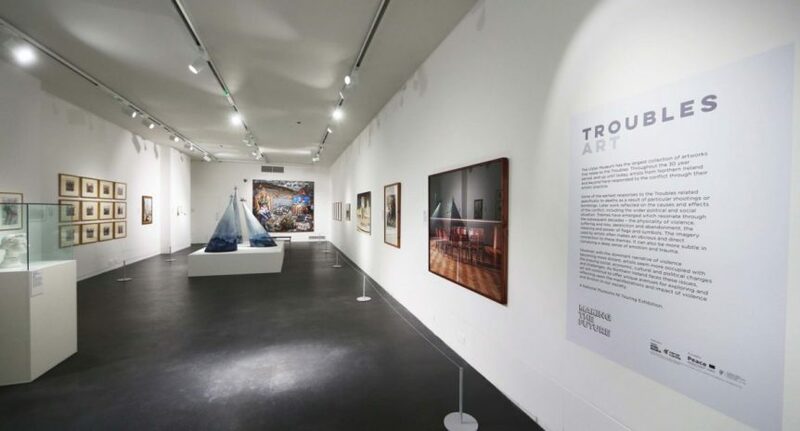 The Troubles Art exhibition comprises of over 40 works, including paintings, drawings, photographs, videos and sculpture – some on display for the first time. Drawn from the National Museums NI’s art collection it explores a broad range of themes which are universal to conflict – such as suffering and loss, violence and destruction, imprisonment, sectarianism, traditions, territory, and life in the midst of turmoil. Among National Museums NI recent acquisitions is acclaimed Magnum photographer, Donovan Wylie’s record of the physical structure of the Maze prison over a six-year period, during its closure and eventual demolition. Other newly acquired works include Gerry Gleason’s Birdcage, 1984 and Gladys Maccabe’s Funeral of Victim, 1969. Visitors will also be able to view artwork such as F.E. McWilliam’s 1974 sculpture Woman in Bomb Blast, one of the earliest artistic responses to the Troubles, photographic works from Turner Prize nominee Willie Doherty, John Keane’s 1989 painting The Other Cheek? and Town, Country and People 1985-6, by artist Locky Morris. The exhibition is part of a major new cross-border programme, Making the Future, funded through the PEACE IV Programme, managed by the Special EU Programmes Body (SEUPB). The regional programme is being delivered by a consortium of leading cultural organisations including the Nerve Centre, National Museums NI, Public Record Office of Northern Ireland and Linen Hall Library. The exhibition is accompanied by an events and learning programme of curator tours, film screenings, family led workshops at weekends and a series of lunchtime talks from some of the artists. Next in the talks programme in Nerve Visual is Peter Richards on February 25, followed by Dan Shipsides (March 28). Rita Duffy (April 5), Gerry Gleason (April 19) and John Keane (April 25). This showing of Troubles Art in Nerve Visual is also funded by the Department of Foreign Affairs and Trade’s Reconciliation Fund with thanks also to The National Lottery Players. Troubles Art exhibition will run in Nerve VIsual Gallery until Sunday, April 28. Open hours: Tuesday to Saturday from 11.00am to 5.00pm and Sunday from 12.00pm to 6.00pm.